On Day 4 we learned about Dad. Unfortunately, Day 4 fell on a Friday that for some reason was very unproductive. I ended up leaving out all of the stuff I had set up for Saturday. I know it is customary to take weekends off. But at the same time, these lessons are so much fun my kids don't really realize it's school. We weren't going anywhere on Saturday, just hanging out around the house while Dad works on painting the outside of the house. So why not? At breakfast I asked the opening question, what is your dad's name? We said the Opening Rhyme and did all the hand movements. As the day progressed we did things somewhat quickly and out of order. We started by Counting Seeds. 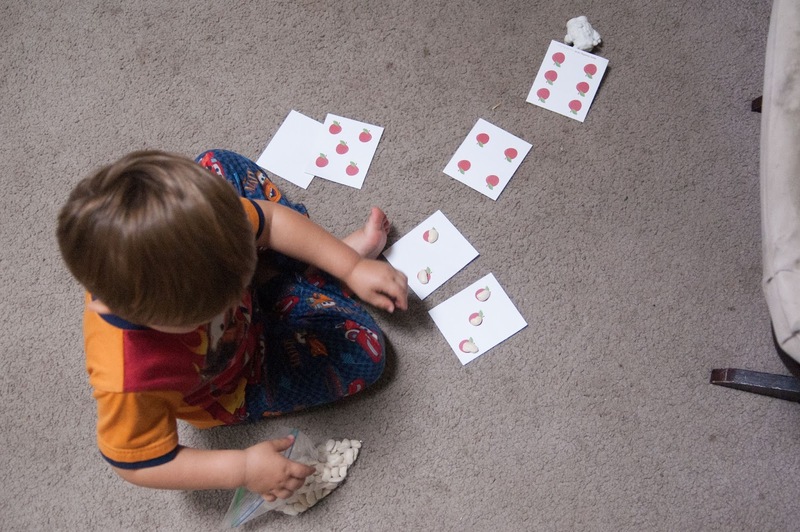 I got out beans and the apple counting cards we got on Day 1. They each drew a card and counted out that many "seeds" or beans. Lachlan did it once and was on his way. Peter sat down, laid out all the cards and put 1 bean on each apple counting as he went. Next I quickly kept their attention so that I could read them the book of the month. 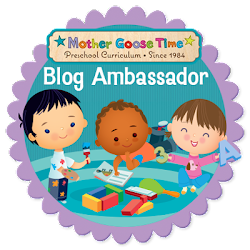 Each month Mother Goose Time gives you a new children's book in your box. 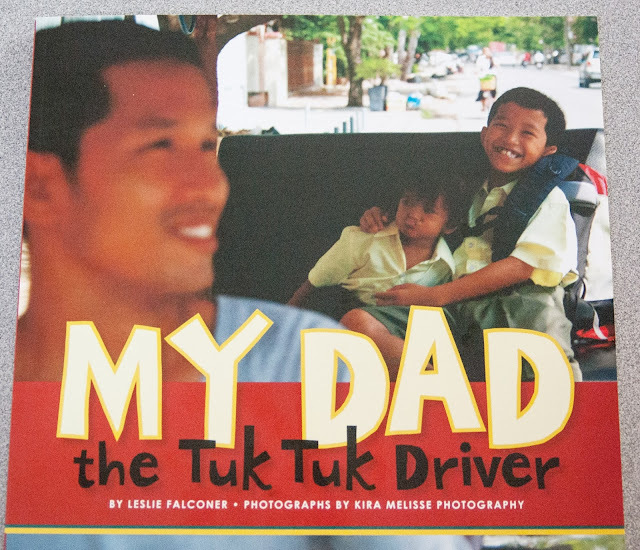 This month the book is called My Dad the Tuk Tuk Driver. There is a lot more to this book and I did a full write up on it here. Needless to say, I have been super excited to read this book with my sons. So far it has brought on some new great memories. Aunt Skippy watched the boys when I went to a doctor appointment to check on baby. In the book it talks about families and asks the question how many people are in your family. Lachlan started the count and stopped at 4. Aunt Skippy added one more, by saying and baby. Ah. So cute. What's kind of funny about this is that Peter has really honed in it. Lachlan, he will count and each time get stuck on the forth family member. Peter, he counts all 4 named family members, then gets a little twinkle in his eye and says "and who else? Baby!" he exclaims. The other day he was in doing his business on the potty, I went to check on him and he is counting his family on his hand. He has his little thumb sticking out and points to it "baby", next finger comes out "Daddy". Then he sees me and smiles, "oh, I was just counting." I am now friends with the Dad in the book, Vibol, on Facebook. I have asked him to let me know of any prayer requests for his family. I would love to teach my children to pray for others. How fun would it be to pray for a man so far away and his beautiful family. Read his book and check in on him via Facebook. I will be reading this book many more times with my boys. Thank you Mother Goose Time for sending us this book, but you didn't just send this out, you wrote it, and published it. We appreciate it. When Peter took his nap Lachlan worked on the Daddy Puppet. I gave him all the pieces, the instruction sheet that showed the finished product, crayons and a glue stick and walked away. He didn't need my instruction on this one. It was fun to just watch him work.